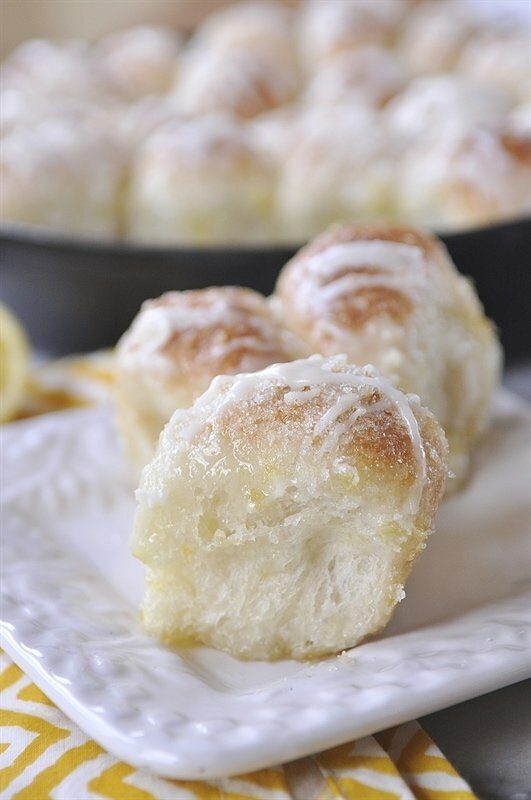 If you have followed my blog for any length of time you know what a lemon fan I am and these lemon rolls have moved up to the top of my list of favorite lemon recipes! Now that the “red and chocolate season” is over and I’ve h ad enough of “green and mint season” I officially declare it “lemon season”. As far as I am concerned, it is always lemon season and I look for every opportunity I can to use lemons. Lemons make me happy. Today’s recipe is perfect for the upcoming Easter season or as far as I am concerned, any season. 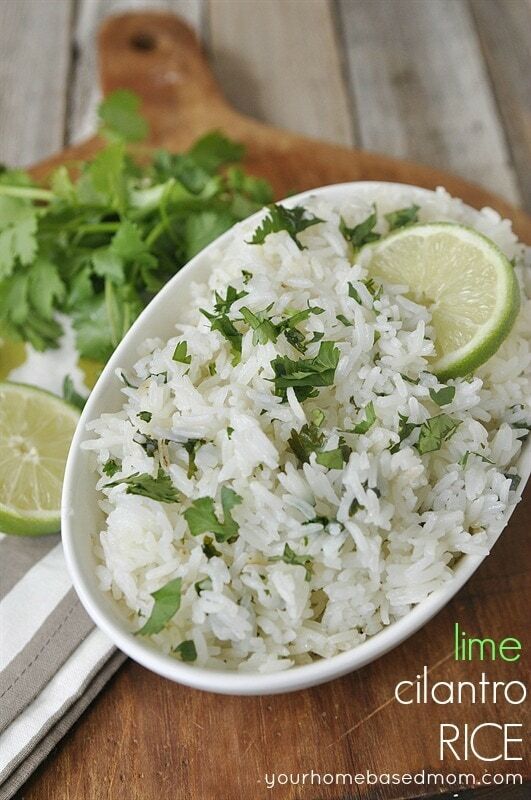 The best part of this recipe is how it tastes – full of lovely lemon flavor. The second best part is how easy the recipe is! It uses frozen roll dough! I actually found this recipe over at the Rhodes website and it was love at first site and first taste! 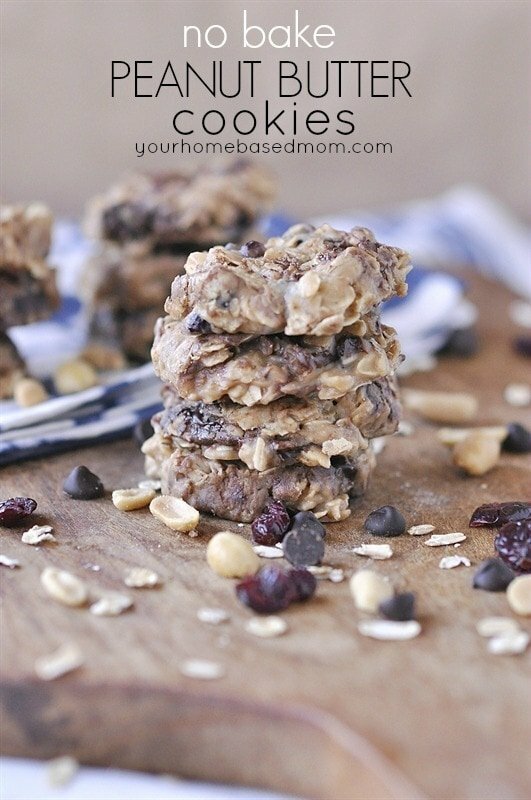 After I made them, my husband tried them and loved them too. I had boxed up some for him to take over to the neighbors and after tasting them he added more to the box. Not because he didn’t like them but because he loved them and he knew he would be way to tempted to eat them all. I have to say when I saw how few were left and what he had done I was a little miffed at him because there were only a few left! Guess I’ll just have to make them again. I used Rhodes frozen rolls but if you can’t find that brand use what is available or if you are feeling energetic you can totally make your own roll dough. 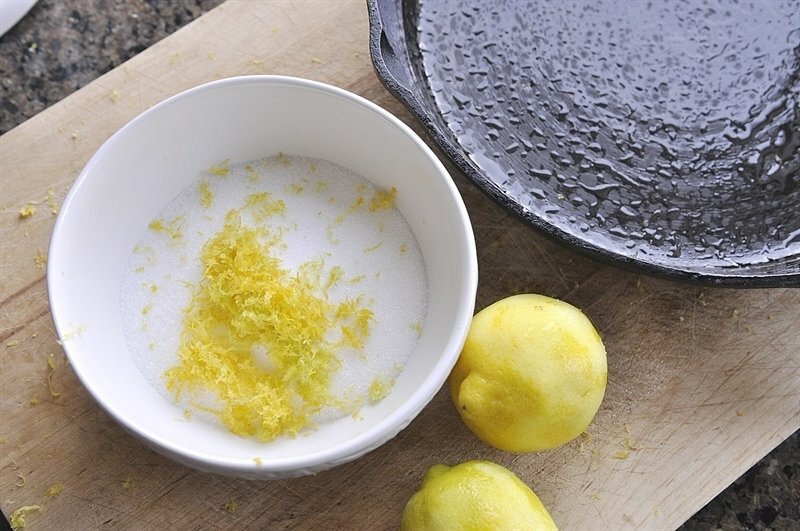 The first step is to mix together the yummy sugar and lemon mixture that you will sprinkle all over the top. I like to use my 10 inch cast iron skillet every chance I get so that is what I used. If you don’t have one, you should! But you can also use a deep dish pie pan too. I let the frozen rolls sit out for a couple of hours. You want the partially thawed but still cold. I then cut them in half and layered them into my pan and covered them with butter! Then sprinkle it with half the lemon sugar mixture. Don’t worry, you’ll be add the rest of it later. Set them in a nice warm location and let them rise for an hour or so or until they double in size. Then sprinkle the other half of the sugar mixture on top. They should look like this. Pop it into the oven and bake until they are baked through and nice and golden brown. 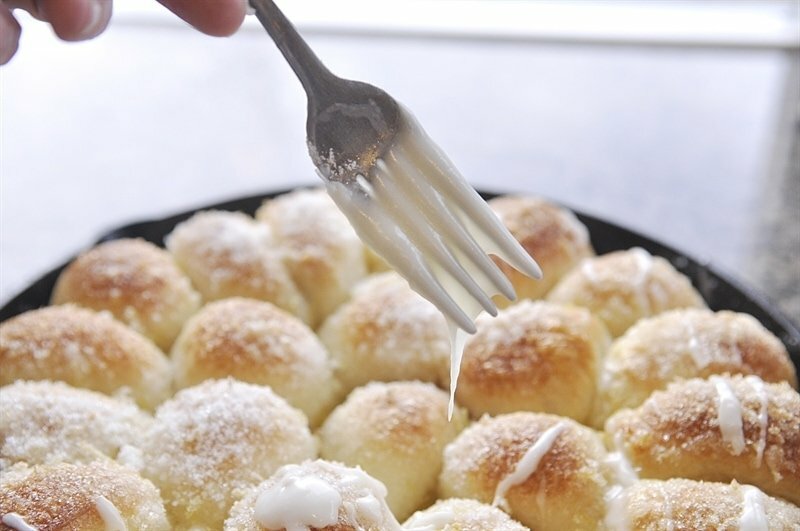 Them drizzle them with a powdered sugar glaze. Aren’t they pretty!? They will look perfect sitting on your brunch or breakfast table. I couldn’t let them cool and I dug into them right away. I wasn’t sorry. The sugar creates a nice crunch, lemony texture on top and the inside of the roll is soft and sweet. Let’s just say I ate my fair share before my husband delivered them to the neighbors. I probably really should thank him for sharing more or I would have definitely eaten them all! 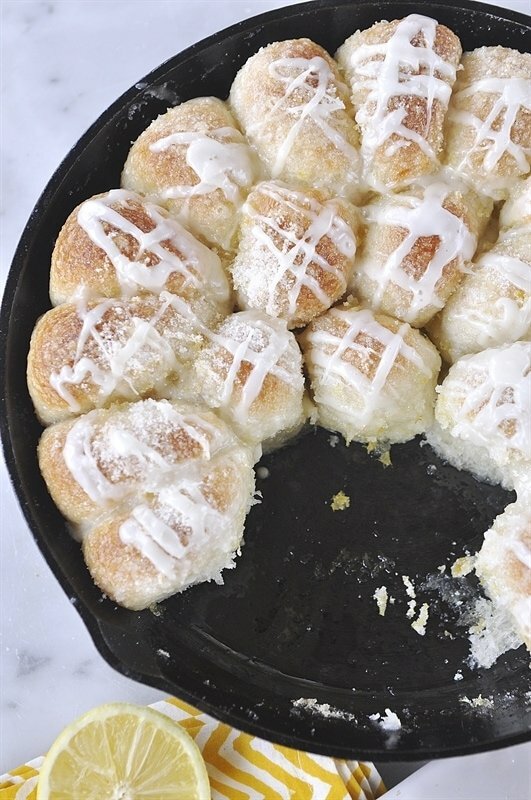 Make these lemon rolls now! Thank me later. I can’t live without my cast iron skillet! One of my favorite kitchen items! Cut rolls in half and place in a 12-inch sprayed deep dish pizza pan or 9x13-inch sprayed baking pan. 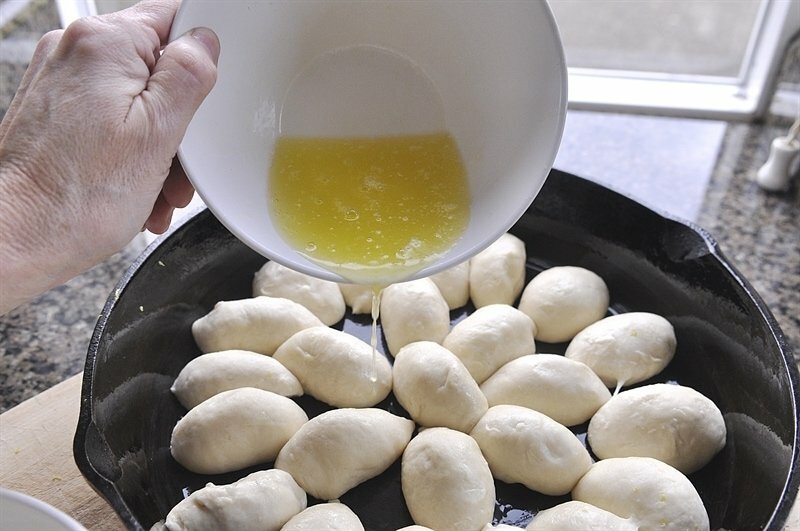 Drizzle 1/4 cup melted butter over rolls. 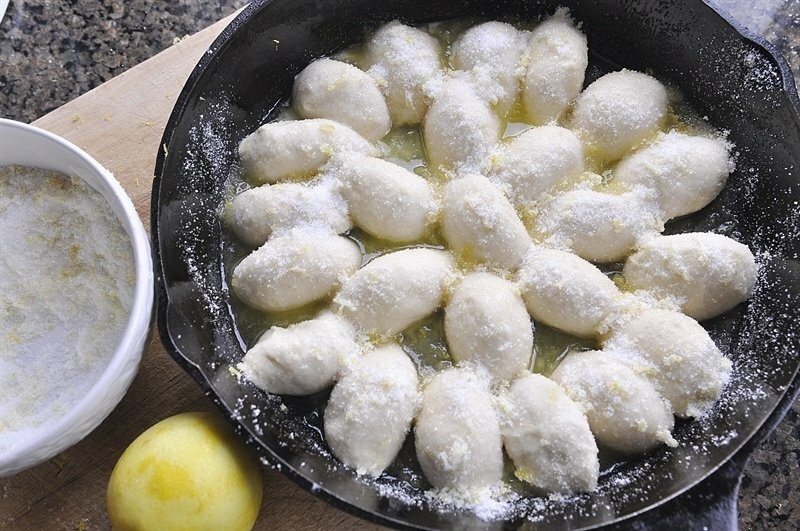 Sprinkle with lemon zest/sugar mixture, reserving 1/2 of mixture to sprinkle on just before baking. Remove wrap. 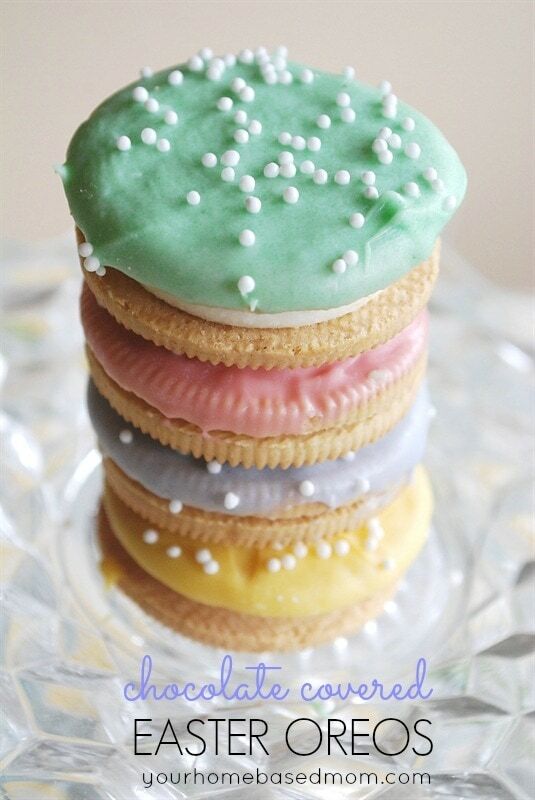 Sprinkle on remaining mixture. Bake at 350°F 20-25 minutes. 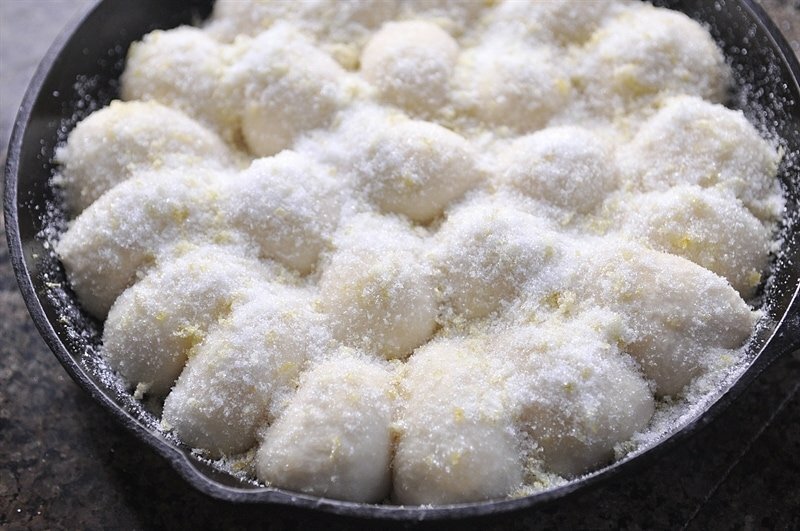 Remove immediately from pan and place on cooling rack. Easter Treats}Chocolate Covered Peeps, Gummies and Oreos! 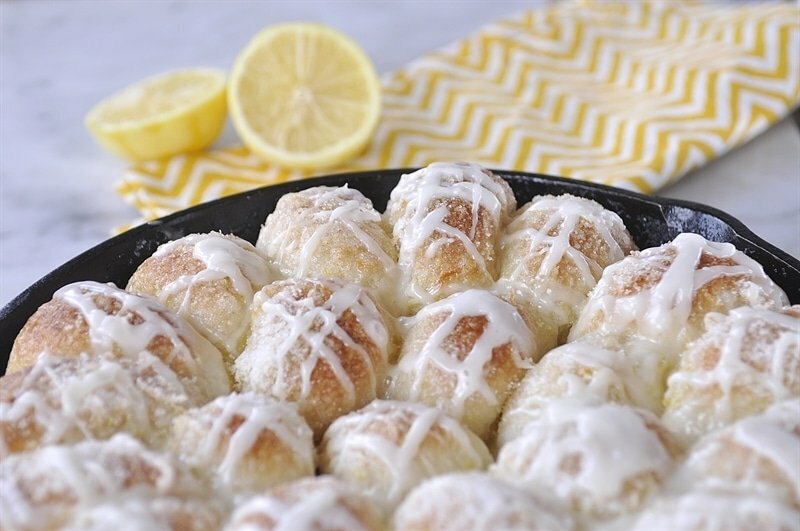 I’m loving all kinds of lemon recipe right now and these look delicious!! It looks like you used 24 dinner rolls. Is that more likely what will fit in the pan sizes you recommend? Erika, I only used 12 rolls and they are cut in half. I explain that in the directions. Oops! Sorry, Leigh Anne…I was mesmerized by how yummy the rolls looked when done. Leigh Ann were you going to post to Pinterest?? I can’t seem to get it to pin from here. And I can’t find it on your boards? Where were you trying to pin it from? 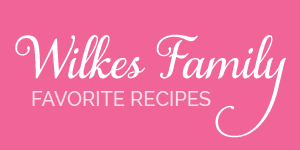 The pin it button on the photo or the Pin button underneath the title of the recipe? 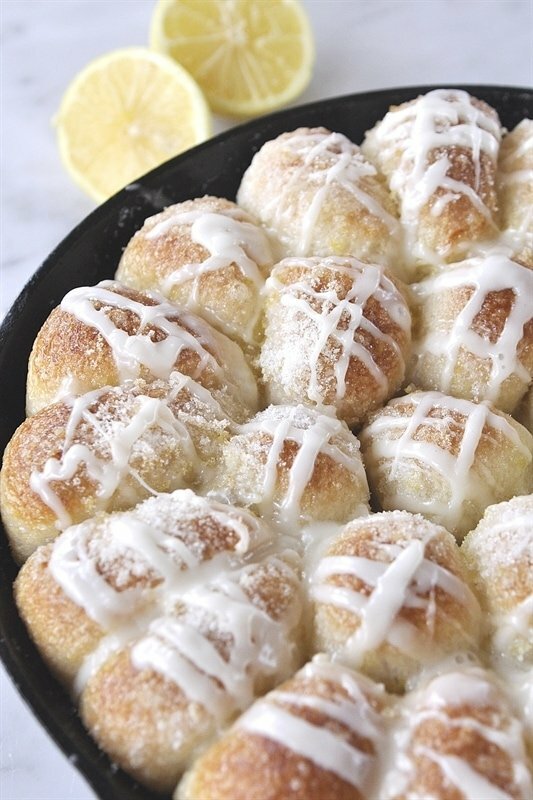 When life gives you lemons, make pull apart rolls! I love the way you think Emily!! I so want to try these. Do you know of any gluten rolls I could use? And thanks for this receipt. I am on the search for gluten free roll dough – no luck yet. 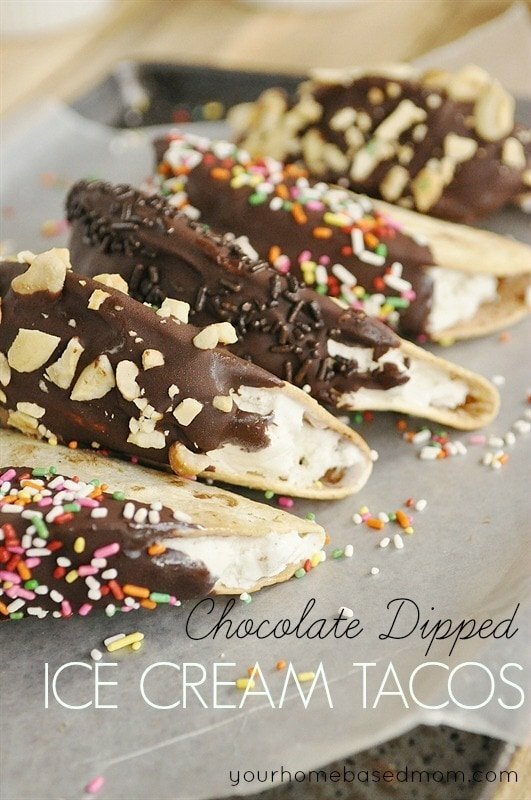 Made these tonight and they are AMAZING!!!!!!! Thank you for sharing them. So glad you loved them too!! What do you mean cut rolls in half? Do not see a pic of this actual step? 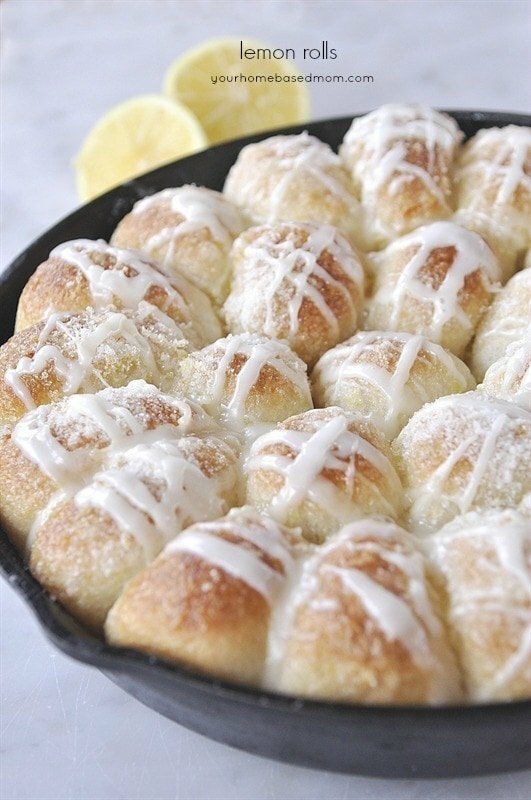 Cut them in the middle or not use the whole pan of rolls? Just take a pair of scissors and snip the ball of bread dough in half into two pieces. 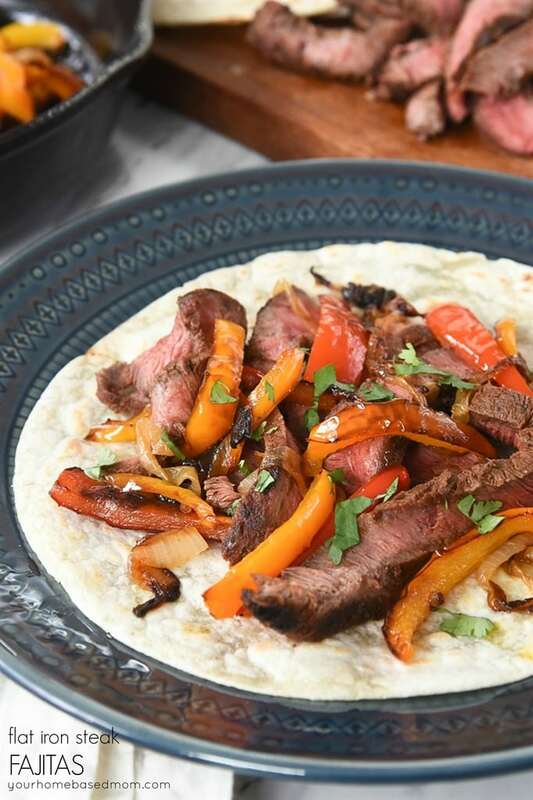 What else do you love your cast iron skillet for? Trying to see if I would use it a ton?? Rachelle, I use mine a ton. I love to make cornbread in it, focaccia bread (recipes on the blog). I also do egg frittata, puff up pancake and just scramble eggs in it. Those are a few off the top of my head. Love that I can use it on the stove top and in the oven. 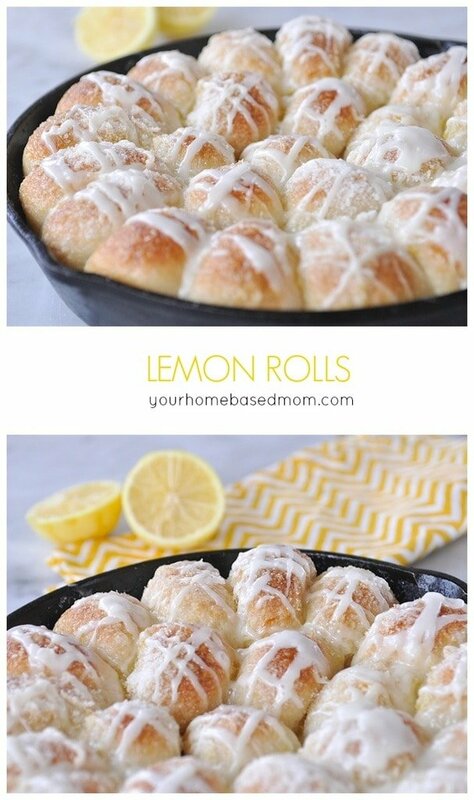 Can’t wait to try those Lemon rolls. Perfect for summer. You say you use the cast iron pan, but don’t mention if you grease the pan or not? Mary, have actually done it both ways and it works fine either way. 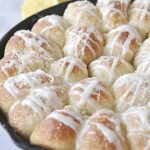 I’m wondering what type or brand of frozen rolls you use and if you’ve ever tried it with any homemade dough?